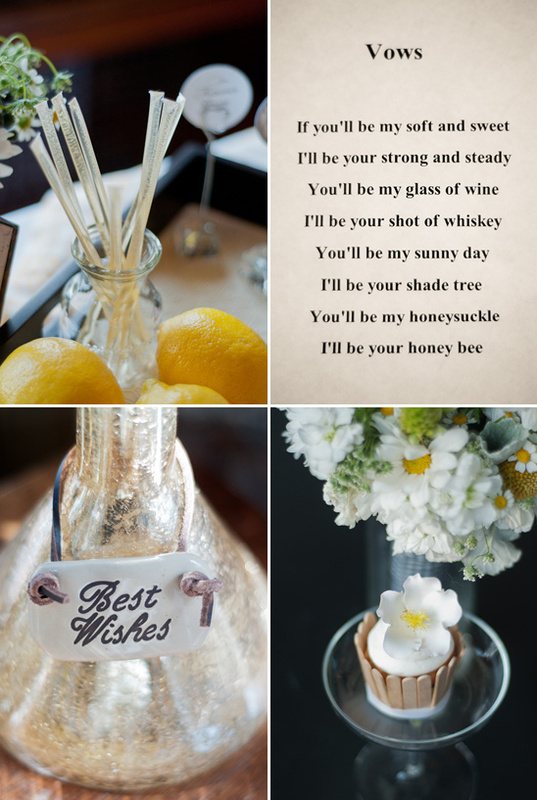 Thinking of adding a little honey love to your wedding? You really can go so many directions with this theme, and Michelle Lemley shows us some incredibly cute ideas to incorporate the sweet stuff into your wedding. 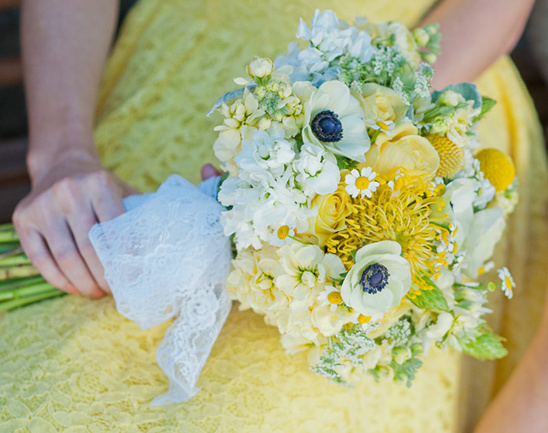 Like dressing your bridesmaids in sunny yellow dresses and having some way cute bee worthy wedding florals to go with everything. 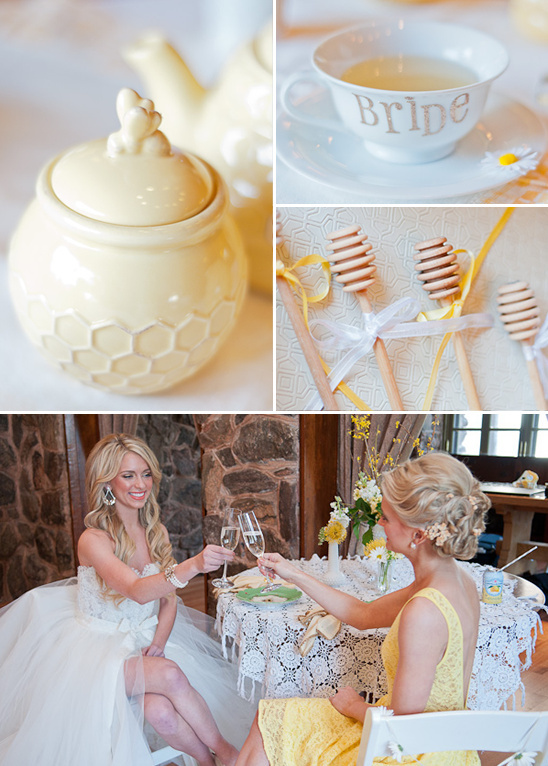 Courtesy of Pink Posey Design, you have to see more way cute honey bee wedding ideas in the full gallery. 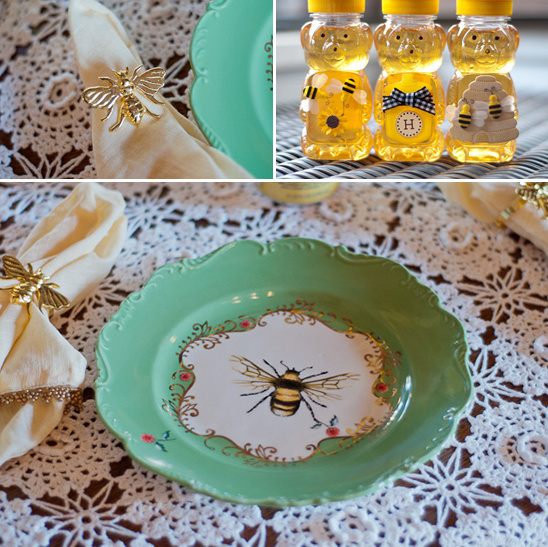 Here is how a bride can create a DIY Honey bee wedding. 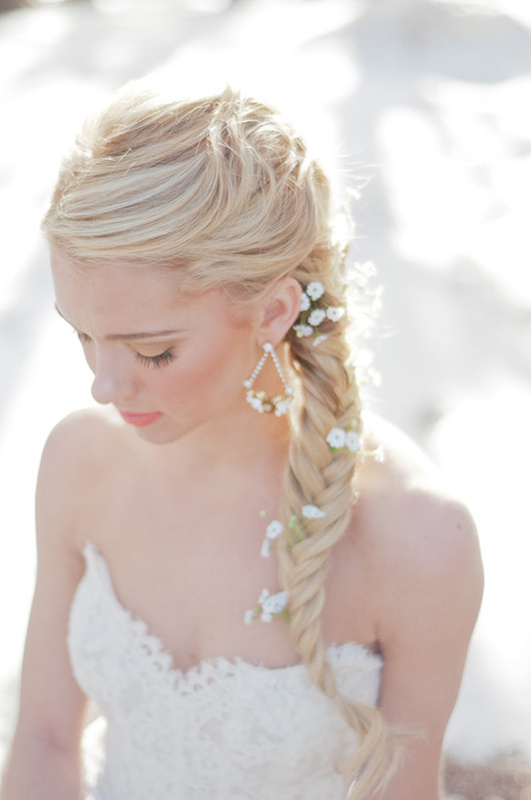 Of course, the best place to start gathering ideas is to find that first inspiration piece. Ours was a gorgeous plate from Anthropologie that had a honey bee in the center. By looking at the accent colors on the plate we came up with colors for the flowers & décor. 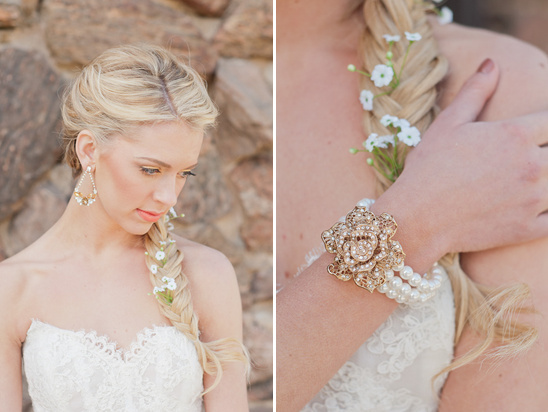 Those included light green, yellow & black, ivory, and soft gold. Then I was able to find beautiful ribbon to wrap the honey sticks & charming stickers to label the honey jars. As far as décor I was determined to find charming details that would boast a soft & sweet appearance. Enter honey bee napkins holders and honey bee bottle caps. To my delight, I found adorable wooden honey sticks to compliment the honey and tea cups. The same day I discovered a light yellow teapot with honey bees engraved in the porcelain. We also had vintage white tea cups and plates that were perfect for our tea and honey bar. The florist used black & white ribbon for one bouquet. 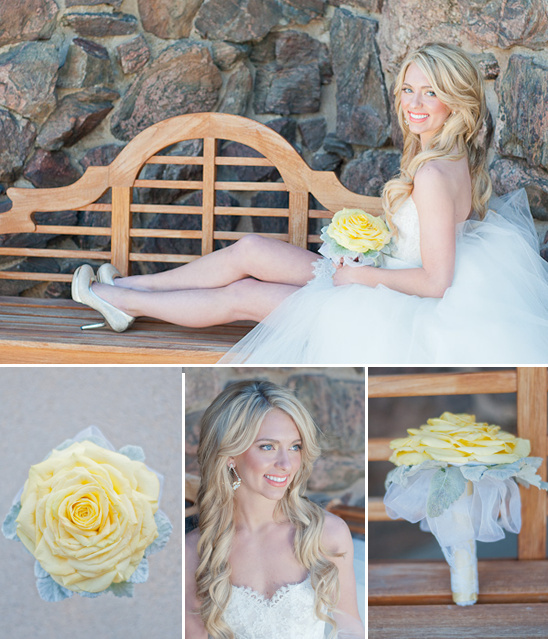 She also created a one of kind bouquet with yellow rose petals resembling one large rose bouquet with a shimmer of white ribbon. The flowers included daisies, roses, billy balls, gladiolas, and anemone’s. 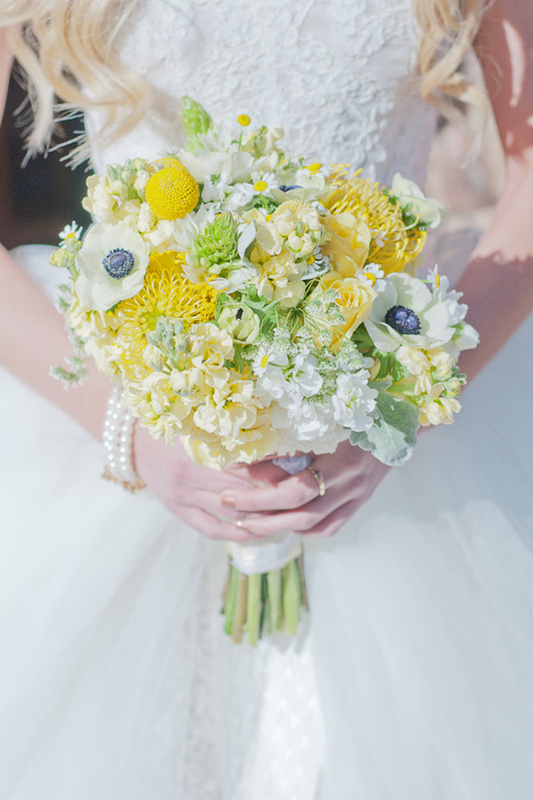 They were simply stunning and one can never go wrong with yellow! Don't forget about the sweets! Our amazing baker created a fluffy ivory cupcake with a beautiful Ivory & yellow flower on top. Finally, I knew I needed to start looking for the Bride & Bridesmaids dresses. I found a gorgeous yellow dress from Urban Outfitters that had an open back. Then we went to Blue Bridal and found the loveliest Tara Keely gown that incorporated the southern belle/sweetness appeal. The end result was a bright and colorful palette with sweet honey, tea, champagne & a gorgeous sunny day.